The open ocean has lost two percent of its oxygen over the last 50 years. Recent research reveals these dead zones could become much more common throughout the world’s oceans. The culprits: pollution and climate change. In a new review paper published in Science, Breitburg, a Smithsonian Environmental Research Center marine ecologist, and her colleagues conclude that oxygen loss in the oceans is a serious threat to marine life. According to the paper, the open ocean has lost about 77 billion metric tons of oxygen in the past 50 years— nearly 2% of its total concentration. 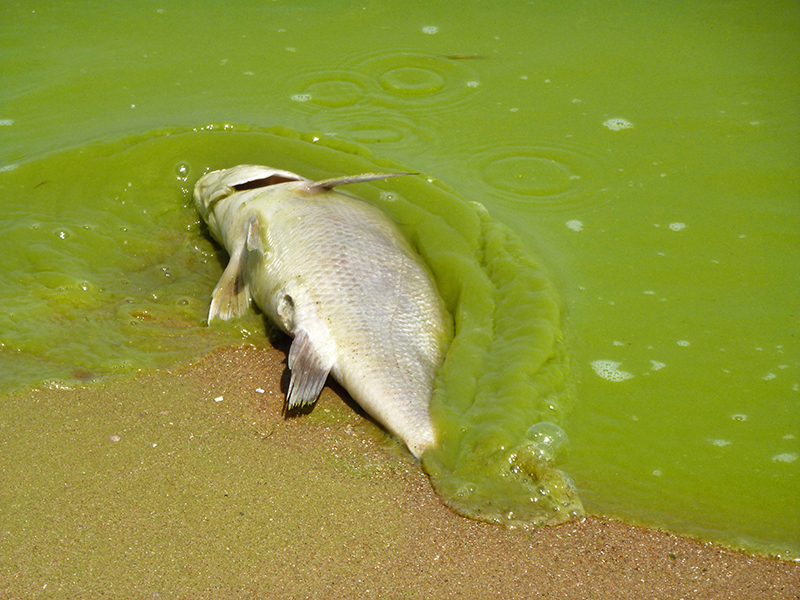 Low-oxygen water near to shore is often due to nutrient runoff, which allows algae to grow explosively, die, and rapidly deplete all oxygen from the surrounding waters as they decay. Harmful algal blooms, and the zero-oxygen “dead zones” they create in both fresh and salt water, have grown worse in recent years. What’s more, voluntary efforts to curb these blooms don’t seem to be working. In the open ocean, however, rapidly expanding patches of oxygen-depleted water are thought to be due to rising temperatures rather than algal blooms. Warm water can’t hold as much dissolved oxygen as cold water, and global sea surface temperatures have increased by an average of 0.13 degrees Fahrenheit per decade since 1901. Since warm water is lighter than cold water, less-oxygenated water also tends to displace oxygen-rich cold waters, making it harder for gases from the atmosphere to mix in. Breitburg’s paper shows that, in addition to dead zones that kill marine animals outright, oceans are seeing more areas with reduced oxygen. These areas can have more subtle effects on marine life: stunted growth, hindered reproduction, and increased susceptibility to disease. These effects can carry-over to human communities that rely on marine animals for their livelihoods. Some fishing communities can’t relocate if local marine populations dwindle or die out. Reduced oxygen water can also kill coral reefs, hindering tourism in areas that rely on scuba diving and snorkeling visitors. While a low-oxygen ocean may feel low on the list of global problems, consider this: the authors also raised the possibility it could lead to a dramatic positive feedback loop. Extremely low oxygen concentrations cause the production of nitrous oxide, a powerful greenhouse gas. More nitrous oxide could intensify global warming and make seas even warmer. However, Breitburg told Futurism that there is disagreement among researchers whether stratified ocean waters would impede that nitrous oxide from reaching the surface. Can humans stop ocean “dead zones” from forming? The authors highlight three strategies: address the root causes of pollution and climate change, protect vulnerable marine life via protected areas or no-catch zones, and increase monitoring of low-oxygen areas, particularly in developing countries. According to Breitburg, we can make a difference both at the individual level as well as through international policy. “Everyone can limit their carbon footprint and reduce their contribution to nutrient pollution,” she said.